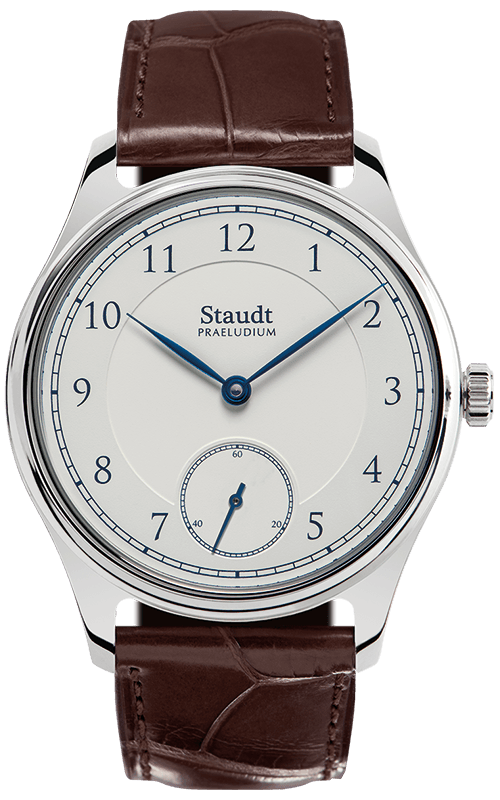 The Praeludium Hand Wound is the watch that started our watchmaking adventure. 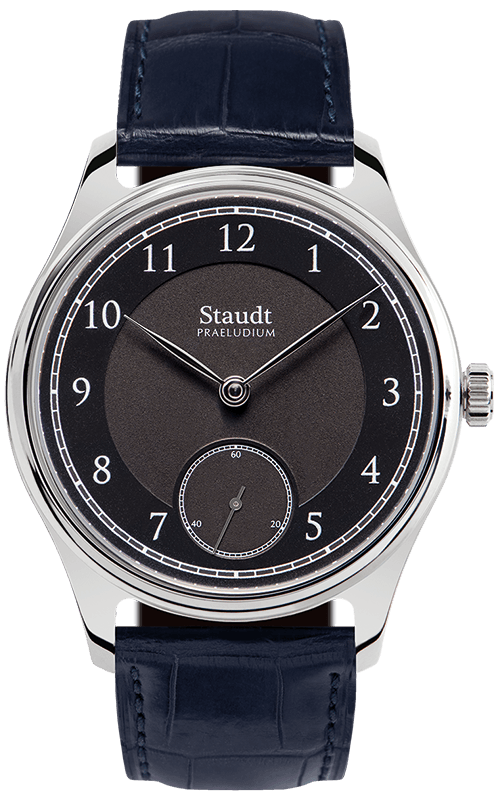 The current model is the fourth version of the very first watch that Yvo Staudt designed during his conservatoire studies. His design needed to meet three criteria: blue, top quality and understated. This personal project, stemming from an attempt to escape loneliness, resulted in the foundation of Staudt Twenthe: the Praeludium collection. Stainless steel watch case with a diameter of 42.5mm and a thickness of 11.9mm. 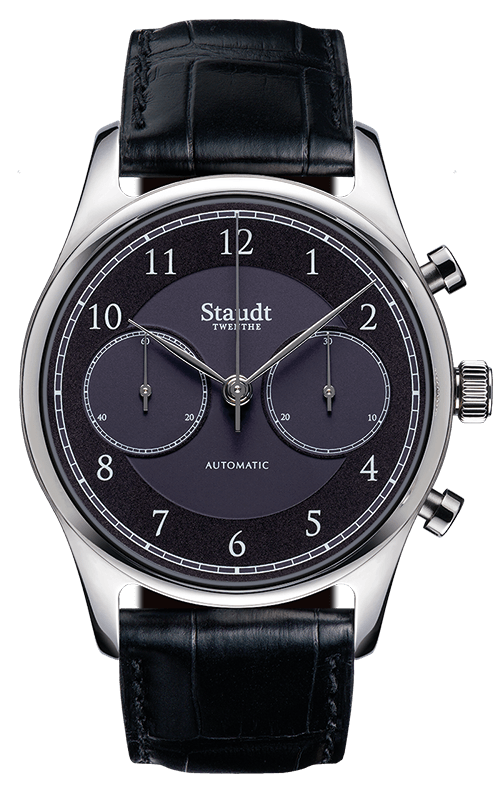 "The watch where it started with. The actual Praeludium Hand Wound is the third facelift of the first watch I ever made. 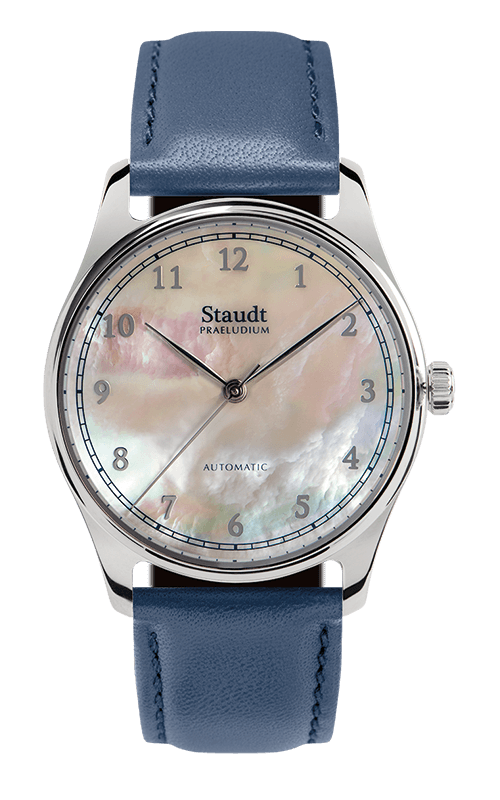 It is the heart and soul of the collection and our brand." The Praeludium Hand Wound is a mechanical timepiece that shows you the time in hours, minutes and seconds. 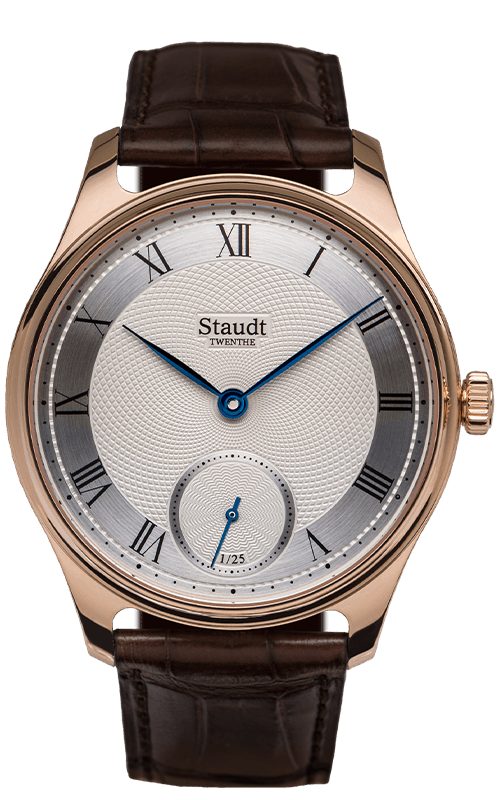 The watch case measures 42.5mm in diameter and is made from either stainless steel or 18-carat rose gold. The watch is water resistant up to three bar and a domed sapphire crystal with a double anti-reflective coating provides a crystal-clear view of the characteristic two-tone dial. 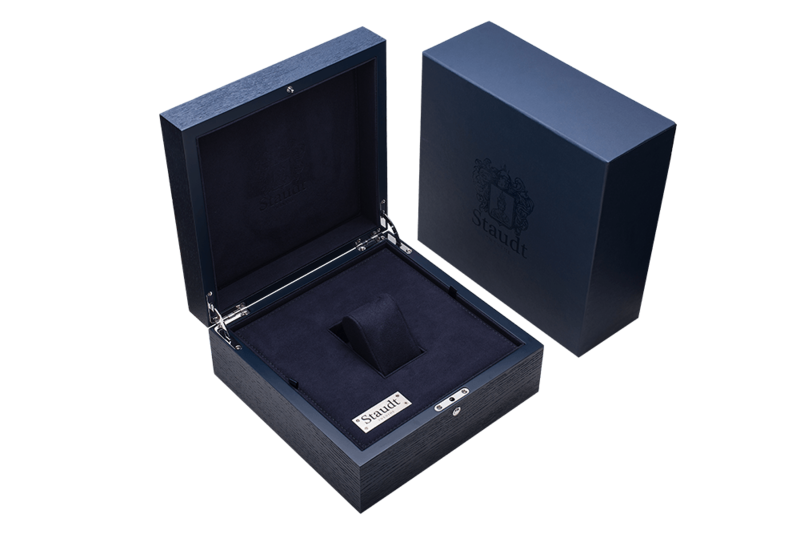 The elegant, leaf-shaped hands are made from high-quality steel and are hand polished. The hand-wound movement has a power reserve of 42 hours and is visible through a glass case back of sapphire crystal with double anti-reflection coating. 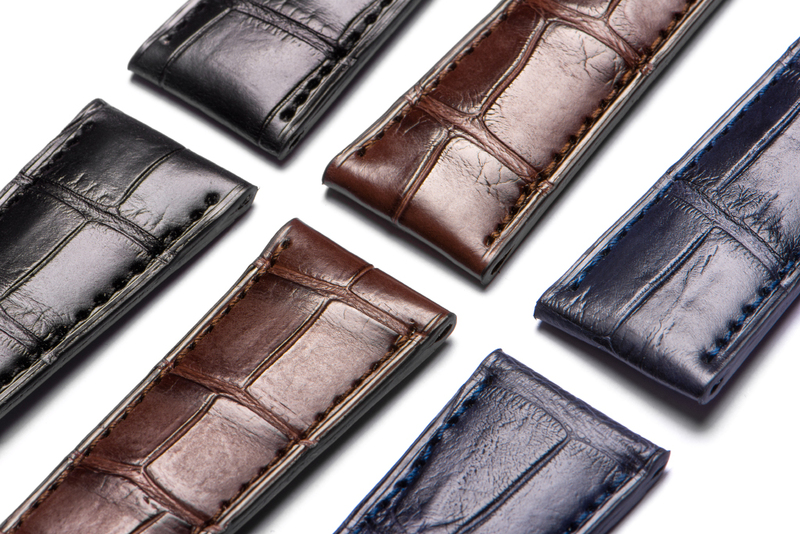 The handmade alligator leather watchstrap with double folding clasp ensures the watch fits elegantly around your wrist. 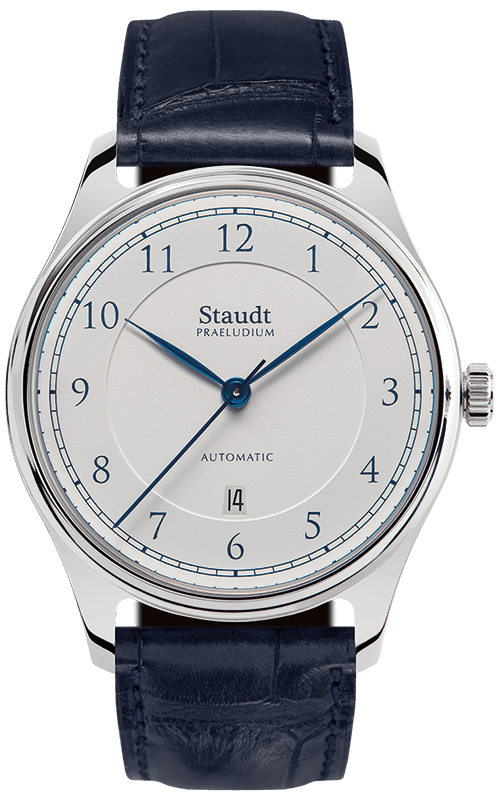 Highly polished steel hands (when dial is ivory: hands are blued by heat). 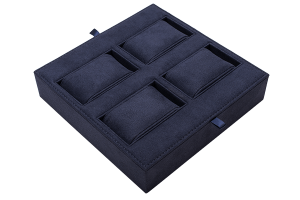 with stainless steel folding clasp. 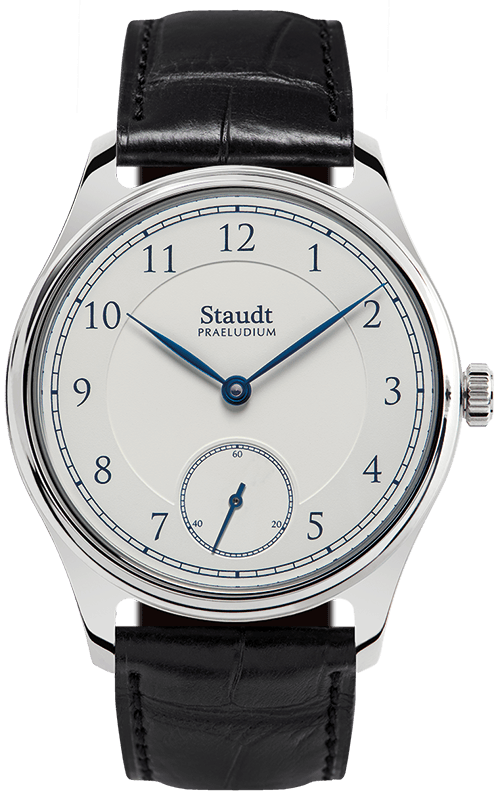 The Praeludium Hand Wound has a Swiss mechanical movement that was developed in-house and must be wound by hand. It is based on a centuries-old movement that was much used in pocket watches. 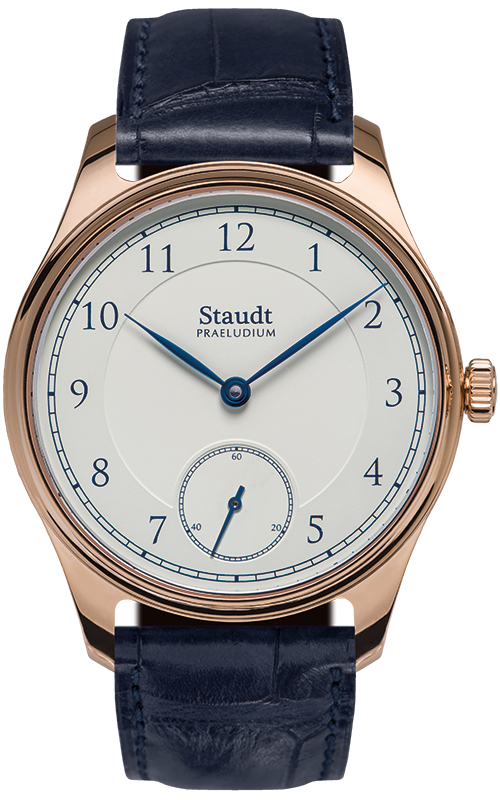 The characteristic 3/4 bridge has an extremely high-quality finish with a circular cote de geneve striped finish and a mixture of blued an polished screws. 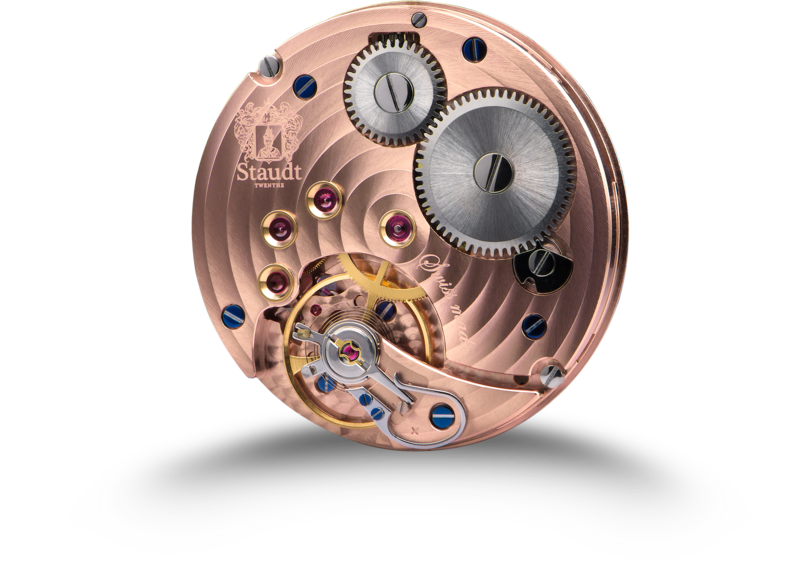 The movement contains 19 rubies, four of which are mounted in chaton de rubis. To optimize the regulation of the movement, a swan-neck fine adjuster has been fitted. The escapement is finished in perlage. 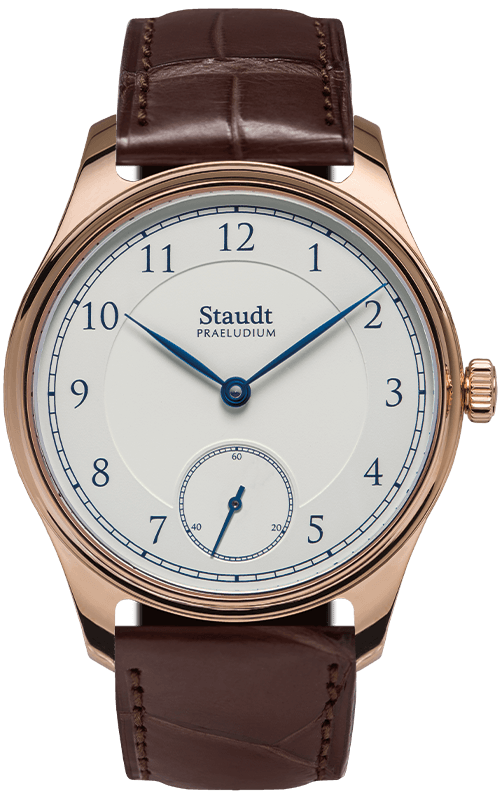 All bridges and the main plate are coated in 18-carat rose gold. 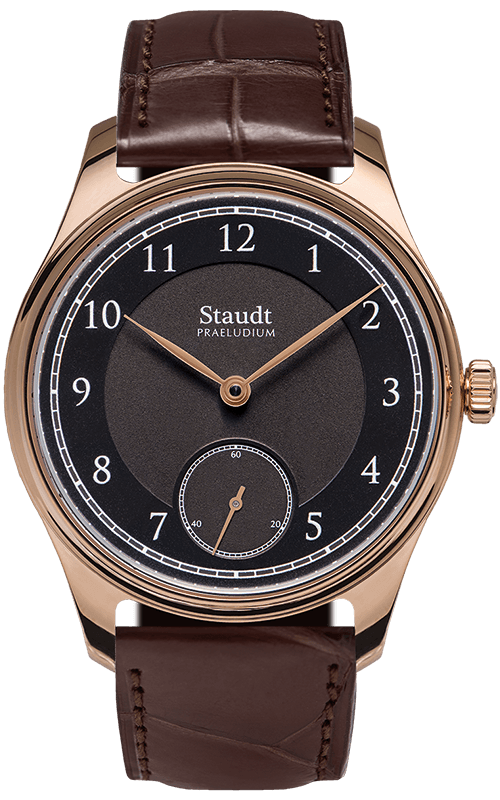 The colour of the outer ring of the dials in our Praeludium collection are build in 12 layers. Therefor we use an century old lithography machine, to make Staudt blue. The outer ring of the dial is spray painted by hand.